The vision of Three Rivers Ringers (TRR) is to be at the forefront of the handbell art form through distinctive musical performance and educational experiences. 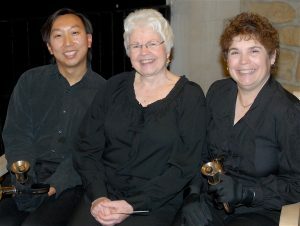 Three Rivers Ringers was founded in 2010 by five handbell musicians with the goal of achieving musical excellence, performing challenging repertoire, and pushing the boundaries of the handbell art form. TRR performed at the General Assembly of the Presbyterian Church (U.S.A.) in 2012 in front of 4,000 attendees, performed for the American Guild of Organists’ regional convention in 2015, and appeared in “Love the Coopers,” a motion picture released in November 2015. In 2016 TRR was honored to perform at the National Seminar for Handbell Musicians of America, the Guild for North American handbell musicians. Of special note, Three Rivers Ringers performed with the world-renowned Pittsburgh Symphony Orchestra at their Holiday Pops concerts in December 2015 and December 2016 to great acclaim. Today, TRR is a significant contributor to the arts culture in Western Pennsylvania, performing both private and public concerts 10-15 times per year in winter and spring. As part of its educational mission, TRR organizes and runs the Western Pennsylvania Handbell Festival, a level 1 & 2 festival for beginning ringers with massed ringing, classes, and workshops. Three Rivers Ringers also gives on-site workshops and mentoring for handbell ensembles and directors. TRR released its first commercial recording, “Ringing in the Season,” in 2014, immediately selling out the first print run. In 2015, TRR was commissioned to record its second CD, “Jubilate,” featuring the handbell compositions of Stanley Leonard, retired principal timpanist of the PSO. TRR recorded two bonus tracks for a new edition of “Ringing in the Season,” released in 2016. Most recently, TRR recorded “Swingin’ Bronze” in 2017, featuring American music from the ragtime, swing, blues, jazz and rock eras. Three Rivers Ringers performs with a 7-octave set of Schulmerich handbells, 5-octave set of Schulmerich handchimes, 1-octave set of Malmark bass chimes, and 2-octave set of Schulmerich Silver Melody Bells. TRR holds open auditions for all positions biannually. Please email us to join our mailing list and follow us on Facebook for updates on all TRR activities. Three Rivers Ringers exists to advance the art of handbells. We are available to give concerts throughout the tri-state area, and also offer educational programs for ringers and directors. For booking information, contact our Managing Director. The Artistic Director of Three Rivers Ringers is Nancy Lutz. The Assistant Conductor is Sarah Boice. For any business questions, contact our Managing Director. A bio for Nancy Lutz can be found here. Bios of the 2018-2020 Three Rivers Ringers can be found here.